these are a bit of a labor of love, but always so worth the effort. fresh rolls in general are truly one of my favorite things to eat! love that chew + fresh flavor + crunch. and sauce(s)! they've got it all, folks. i personally wanna run to the hills when i need to use a mandoline to slice vegetables, so i'm sometimes willing to take the extra time to cut them all manually with a knife. but, if you're not jaded by your mandoline experiences - please use one and save lots of time! i've started using two rice papers per roll because you can hold a lot more goodies inside without the paper flimsy-ing out on you and making you want to quit. especially since these rolls have the bulk of the chicken and no rice vermicelli noodles, the 2nd rice paper adds that extra chew that we like. it's tough for me to get away with making a dinner without meat around here. i'm pretty indifferent about the presence of meat as protein, but peter's convinced we've gone vegetarian when i make dinners without any meat. i just don't care, man. but... i DOOO care about this coconut chicken. because YUM it isss goooooood. simple to make, spicy, with a perfectly subtle coconut flavor. we are having a real moment with FRESH MINT lately. fresh mint all ova! 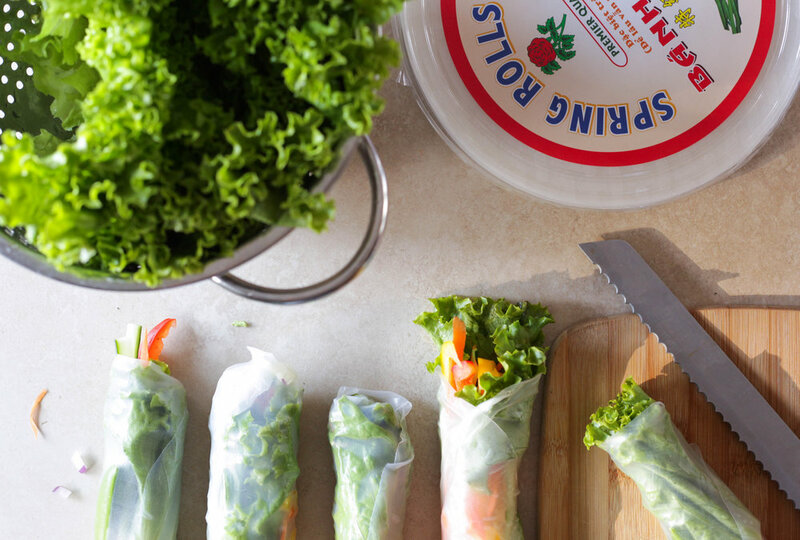 these fresh rolls use thai basil, cilantro AND fresh mint - so there's TONS of flavor. but we really think its the mint that takes the flavor over the top. if you have a helper, these can come together in a flash once you have everything prepped. 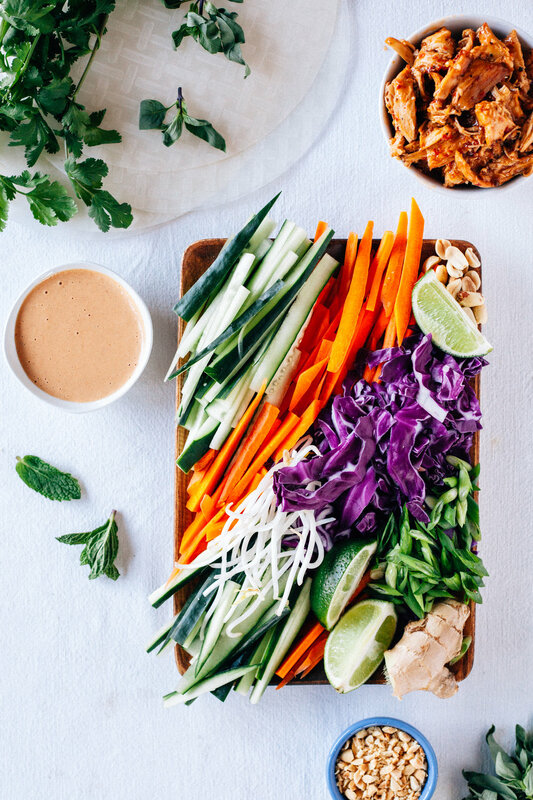 i'd recommend making the peanut sauce while the chicken is cooking, and slicing all the veggies while you're waiting for the chicken & coconut milk to simmer. 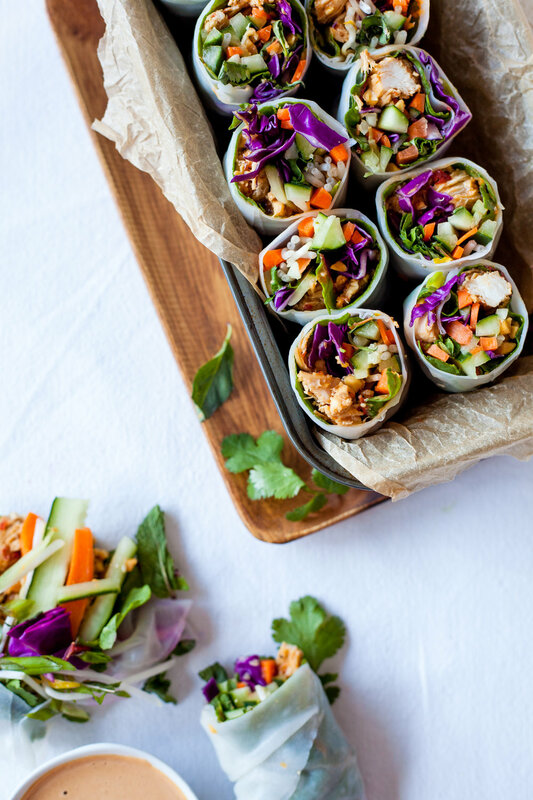 don't be too intimidated by the ingredients list since it's kinda 3 recipes going on - the coconut chicken, main ingredients for the rolls, and the peanut sauce. these are so perfect for dinner now that it's springtime! peter & i have been on a picnic spree lately if there's nice weather in the evening. we are lucky to live next to the water and walk there with our picnic dinners, or just park our vw bus on the water side of the street and slide open the back door and chiiiiiill til the sun sets. either picnic method makes me very happy after 5 months of darkness & hibernation. yay for spring. on our dinner picnic when we ate these very fresh rolls, pete said that i could "sell these for a million dollars." this is saying a lot because he's a food critic by night. lol. an up-vote from pete is a very strong approval rating. also these are just so FRESH and crunchy and delightful. if i had the patience to make 'em every day, i would! In a pan on medium heat, heat a tablespoon of olive oil and minced garlic until fragrant. Add the raw chicken and add a pinch of salt & pepper. Cover and cook for 4 minutes per side, adding another pinch of salt & pepper after the flip. Add 1 TB soy sauce and 1/2 a can of coconut milk and cook a few more minutes on medium-low until a gravy forms. Place the cooked chicken breast on a cutting board to rest for a couple of minutes. Stir in 2 TB sambal oelek to the coconut milk gravy. Filet the chicken breast in half and shred the meat using two forks. Return the now shredded chicken to the pan, toss to coat and simmer everything on low until the gravy is thickened. While the chicken is cooking, you can begin chopping all the veggies or preparing the peanut sauce. For the peanut sauce, add all peanut sauce ingredients listed in a food processor or blender until smooth. Store extras in a jar or airtight container in the fridge. With all the components set up in an assembly line, lay a wet kitchen towel on a cutting board where you will build the rolls. Use a pie pan full of very hot water and soak 2 rice papers together at a time for about 20 seconds, until the papers are translucent and soft. Keep the 2 papers together and transfer flat onto the wet towel. 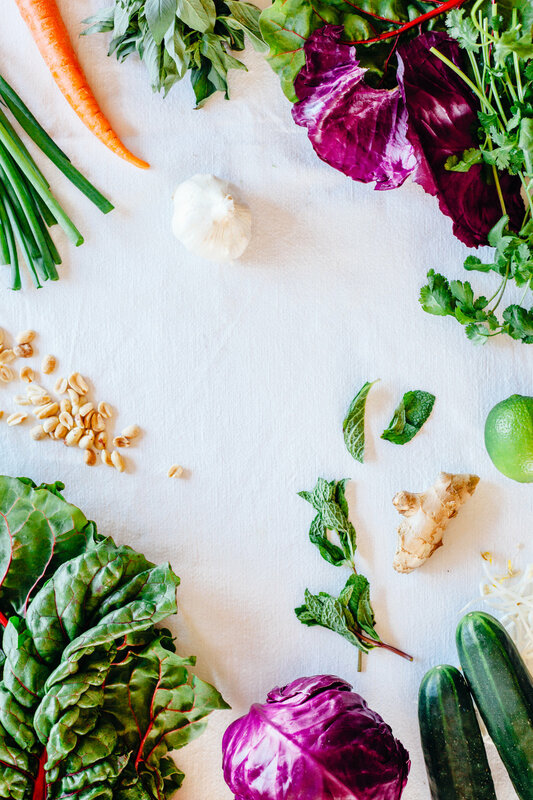 Place the green leaf lettuce or chard leaf as the first layer, followed by a sprinkle of chopped peanuts (keep peanuts away from the rice paper so it doesn't puncture). Add a little bit of the shredded chicken and all the prepared veggies, along with plenty of Thai basil, cilantro, fresh mint, and a squeeze of lime juice. Scoot the veggies toward one edge of the rice paper with your fingers, pull the rice paper up and over to cover the veggies, then fold the sides of the paper up to hold everything in (just like rolling a burrito). Keep everything as tightly bunched together as you continue to roll everything all the way up. Repeat with 2 rice papers per fresh roll until all the toppings are used up. Use a serrated knife to cut the rolls in half on a cutting board - press the knife down very firmly until it's cut in half and drag the knife firmly toward you to make a clean cut all the way through. Enjoy immediately with peanut sauce. Eat within one day! 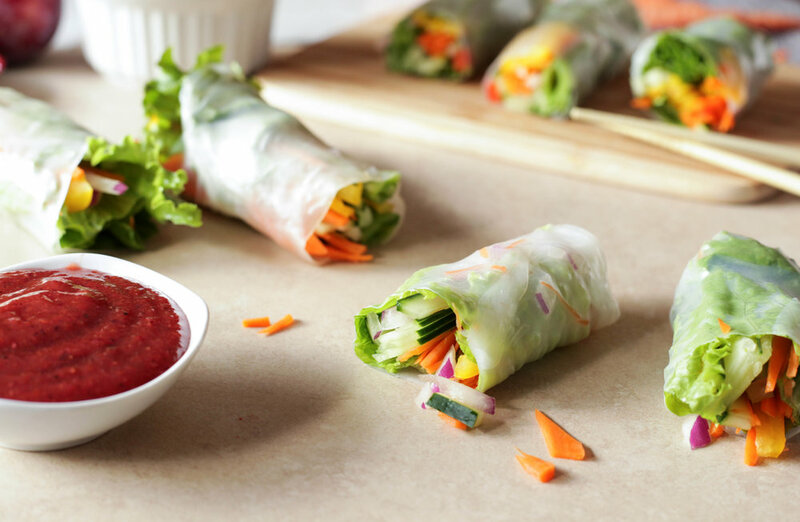 rainbow fresh rolls with spicy plum sauce, & peanut sauce. i love fresh rolls, man. do ya call them spring rolls if they're fried and fresh rolls if they're not? because i've seen this type called both names. anyway these are so fReSh and beeautiful to look at. and a perdy spicy plum sauce, to boot! ...peanut sauce too because variety rules. i was slightly bummed that these weren't the plums with the pretty dark red insides. how are you supposed to know whats in there without biting into the plum at the store?? i know there are red plums and black plums and other plums, but google wasn't sure about the contents of plum innards when i needed answers. are they just different levels of ripeness? these are "black plums." but i wanted black plums with red insides. oy vey. anyhoo, those plums with the pretty dark red insides are soooo delicious and juicy. these ones are gooood, but firm, ya knowwww? whatever, i need to get over it. i simply used these particular veggies because i wanted raaainbow rolls. but these are so super customizable and you can use what you like. i wouuuld highly recommend the green leaf lettuce, cucumber matchsticks, and sugar snap peas. for the crunch factor. once you've got all your veggies and things sliced and ready, these are so easy to make! i was determined to make my own plum sauce and this one turned out prettyyyy darn well, i'll say. it actually tastes like...plums! haha. though i do thoroughly enjoy that molasses-y plum sauce they give you at restaurants. this one is just super "FRESH" (settle down on the "fresh", i know), flavorful, and spicy. and then i was like... well this needs peanut sauce too, just in case. don't be alarmed by the long ingredients list. 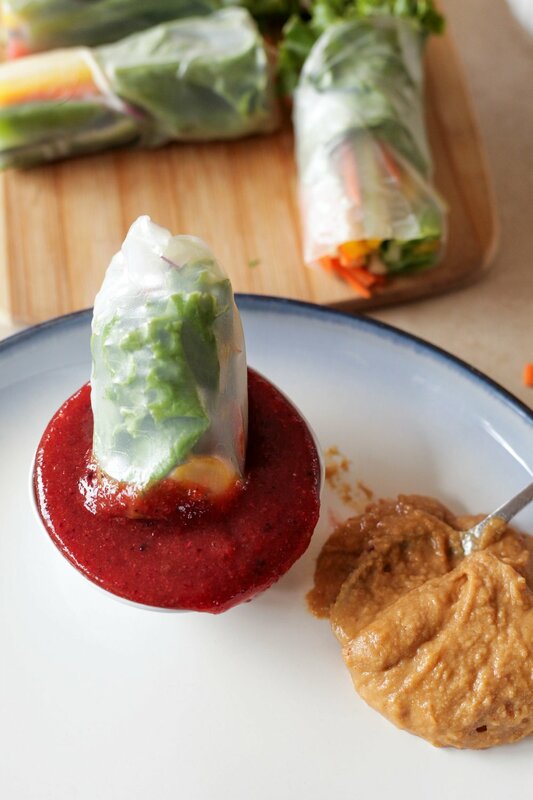 you can make the plum and peanut sauce in advance and store them in the fridge. then when all the veggies and things are chopped and ready, this comes together in a jiffer! yumyumyum! sooo crunchy, healthy, flavorful, & satisfying. and that other "F" word, too. For the plum sauce, quarter the plums and remove the pits. In a pot over medium/low heat, simmer the plums, water, and brown sugar for about 20 minutes, or until soft. Add simmered plums to food processor or blender and add the remaining plum sauce ingredients, pulsing as you go until smooth. Store in an airtight container in the fridge. For the peanut sauce, add all ingredients to a food processor or blender and pulse until smooth. Add only 1/4 cup of water at a time and determine whether you'd like the sauce thicker or thinner. For the fresh rolls, wash and slice all your veggies. Add warm water to a pie pan or shallow, wide dish. Place a damp towel on the table or cutting board to build your fresh rolls on so they don't stick. Soak one rice paper at a time in the warm water for about 10 seconds, or until transparent and soft, but not slimy. You want them to be just a little firm still. Carefully place the soaked rice paper onto the damp cloth. 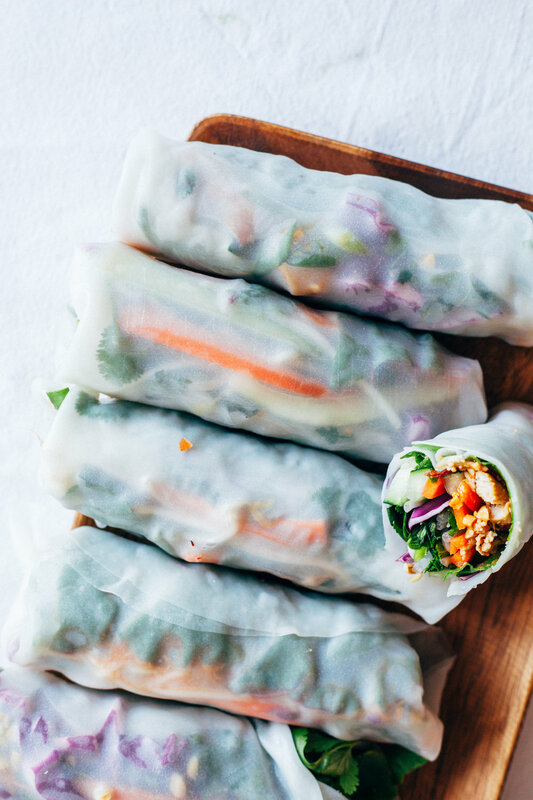 Spread your veggies across the rice paper, closer to the edge instead of the middle. 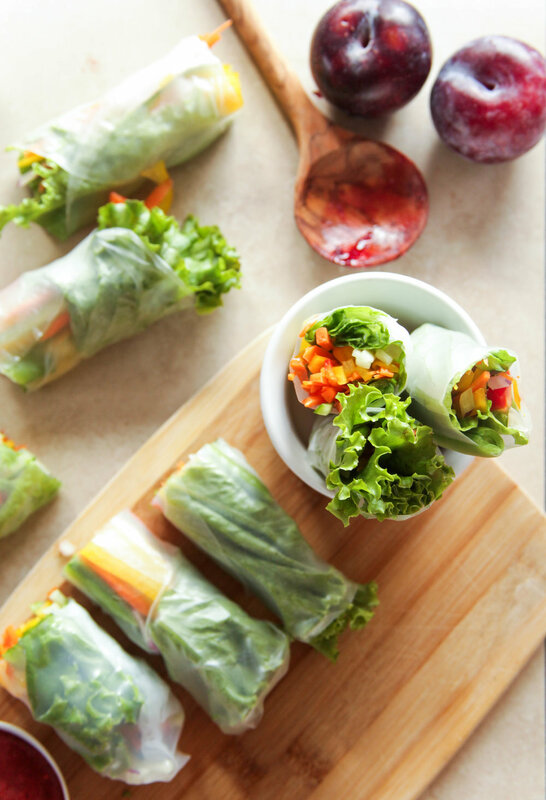 Carefully roll up the rice paper around the veggies. You can leave the side edges open or fold them in before rolling it all up. With a serrated knife, cut the rolls in half. Serve with cold spicy plum sauce and peanut sauce on the side.